Well, I finally had some time to play and turn Abby into a little bit of art to show off her personality. I had some real fun making the above tag, that I was able to turn out on loads of kool items. Click on the t-shirt and you'll be able to see what we've turned it into. Keep in mind that when I do a photo shoot, chances are that I will take photos of your pet and put him/her into his/her own bit of art also. 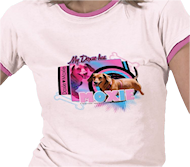 You can find more doxie greeting cards at Fine Art America.